Another pair from the pile of socks-in-progress is done. And this one meets two goals. I took notes on sock one so I could reproduce it on sock two. And, I've finished another 2005 MDSW yarn purchase. Pattern Basic 60 stitch toe-up with a figure 8 toe and a short row heel. I did calf increases so I could make them longer without cutting off my circulation. To fit my leg, I increased 2 sts every 4 rows a total of 8 times (to bring the stitch total to 76 sts). The tubular bind-off was fun but took some practice. The second step (when you're going through stitch 3 purlwise, while stitch 2 is still on the needle) needed to be looser than I originally thought. I had trouble making it loose without being loopy until I started stretching the ribbing after performing each step. I just did a quick stretch and it really seemed to make everything look nice and smooth -- and stretchy. I love these socks so much that I've already worn them twice in just a few days. I washed and dried them inside out and they did just fine in the laundry. Their first wash definitely softened them up a bit too. A scant 14 months from the cast on date and these are done! Modifications The pattern is top-down with an afterthought heel (they call it a peasant heel). I did mine toe-up with a wrapped short row heel and EZ's sewn cast off. I picked this pattern because I wanted to find something other than a basic stockinette sock for the Trekking. I didn't want something so patterned though that it would interfere with the pretty, subtle colors of the yarn itself. The slip stitch pattern did the trick. After knitting a repeat it was easily memorized, and it gives the sock just enough texture to keep it interesting to knit as well as look it (now that they're done!). The book has some great patterns in it. Amazon's view includes the back page which shows closeups of all 12 socks. At 14 bucks this book is a deal. There's also a follow up book--The Sock Journal--that includes 12 more socks. I don't have this one yet but you can check out the back page for closeups of the patterns as well. 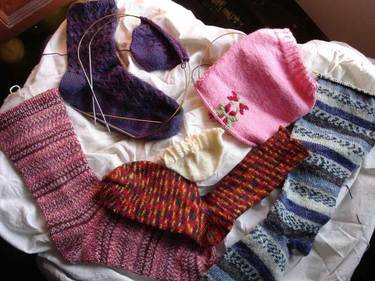 I did find the yarn to be somewhat splitty while knitting them, and although I could knit them without looking, I'd have to do a quick survey each row and note if any stitches had become split. I've already washed and blocked them and I noticed no substantial change in texture or gauge; the water remained clear even on the first wash. This yarn isn't the softest sock yarn out there, but it's not scratchy or uncomfortable either, and I expect the nylon content to make a good long-wearing sock. In case you're counting, I'm now down to 5 socks-in-progress. Not a bad way to usher in my first FO of 2006. Someone (which blogger had this idea in the first place?) started going back and giving thoughts on projects after she'd worn them and used them for a while. It's an awesome idea and I have several in mind. Since I'm wearing my Jaywalkers today (summary post is here) it seemed fitting that I talk about them. In general I still love them. The yarn (Tess Super Sock) machine washes and dries perfectly. I do turn them inside out (no different than how I wash most T shirts and washable sweaters) so the RS doesn't get too beaten up during laundering. 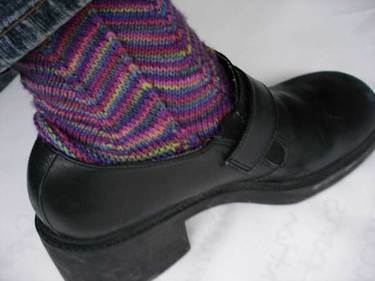 The big change I made to the pattern was using a garter stitch heel. I still think the heel is great. It's cushy and form-fitting. As long as I'm wearing mules. When I have shoes with a back the heel stretches and poofs out of the top. After walking around for a couple minutes things seem to settle in place and relax and the heel looks normal, so it's definitely something I can live with. I think this problem is caused by the fact that I made this heel deeper than I usually do. This combined with the stretchiness of garter stitch makes for a growing heel. Next time I'm going to try making the foot a couple rows shorter -- probably about a half inch. I am still very happy with the shape of the deeper heel so I don't want to make it shorter. To sum it up -- I like the heel, it just needs a little tweaking so it's perfect. So...I have some good progress to show! Last Sunday I had less than a half a foot of the India sock done...and today it's finished! So now I'm onto sock #2 of the Trekking. I cast on for sock 1 over a year ago, so rather than just a quick cast on I had to figure out how many stitches to start with, what kind of increases I used, and how frequently I increased. They're almost identical, but they look the same on my feet so I'm fine with it. For now I'm sticking with socks and only socks for January, but it's early so don't be surprised when I stray. As for the Koigu contest, there are a few strong contenders and I need to make a final decision. I'll announce a winner over the next few days. Christy and Katy had similar points in suggesting if we go shopping and can't find anything else that we'll buy sock yarn so we don't come home empty handed. This one hit home. I am positive that I do this (although I never noticed it until she said something). Johanna suggests I forget about knitting all the yarn and just roll in it. I like her style! Amy suggests I use the Koigu for something else. I have considered that, but dismissed it because all the colors I listed are doubles. I bought 2 hanks just for socks. It doesn't mean I _have_ to make them into socks, but it seems like the best fit. It got me thinking "What else could I do with all these double hanks of Koigu?". The 2 hanks total 350 yards, so I have 350 yards of each of the colors you see here. What is your best suggestion for how to use this yarn? Use one ball, or many. Mix and match as you like. I will say that my inclination is to not split up the 2 hanks of the same color, but I'm open. My favorite suggestion wins...what else? A couple hanks of Koigu -- maybe from the stash, maybe new. I haven't decided yet. So give me your best idea. I'll leave the contest running until Saturday. I catalogued all my sock yarn. 20 wasn't even close. I have yarn for a solid 31 pairs. This does not include yarn that's not necessarily for socks (e.g. Schaffer Anne). I'm tempted to declare January a War on Socks, but that'll surely jinx me. If I'm going to be serious about my goals I need to examine my sock knitting. These are my current SIPs (socks in progress). They're all lovely, and any of them would make a welcome addition to my sock drawer. Problem is, I'm no more than halfway done with any of 'em. Regia Jubilee in India. Love love love this self-patterning yarn! 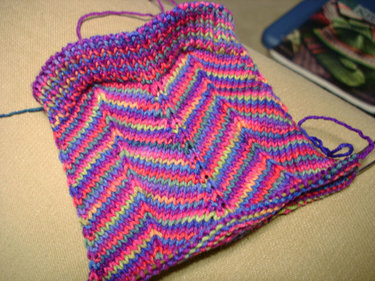 A twisted stitch sock of my own design. Still in the very early design stages, and actually...too wide and not enough patterning. More on that in another post. 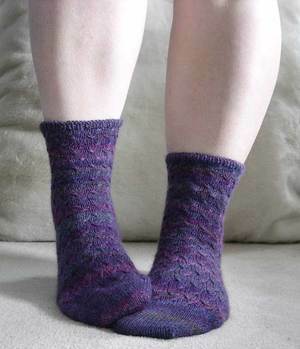 A Trekking sock in a slip stitch pattern. An almost complete knee high. Kellee even sent me a huge spool of clear elastic to do the top portion so I'm out of excuses! Red Skacel Trampoline sock. This is my first sock with elastic built into the sock (instead of lycra it's something they call "polyester elite"). It's so form fitting and should be really comfy to wear. So there you have it. 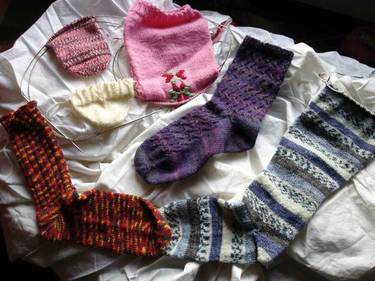 Six pairs of socks -- most of them are 50% complete. How am I going to avoid this in the future? First off, I'm going to give 2 socks on 2 circs a try. Now that I've tried 2 sleeves at once, I'm very interested in trying 2 socks. I think this might do the trick because what I've noticed is that I motor through sock 1 because I can't wait to see what it looks like. If I have 2 on the needles, it stands to reason that I should motor on through the two (right?). BTW, I'm considering making it a rule that I need to knit up all previous MDSW sock yarn before this year's MDSW. 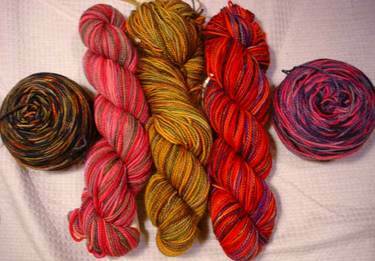 I have knit some of it so I only have yarn left for 3 pairs, one of them being the Regia India above. I know I'll be adding to the sock stash at MDSW so maybe a little self-imposed stash cleansing is in order.